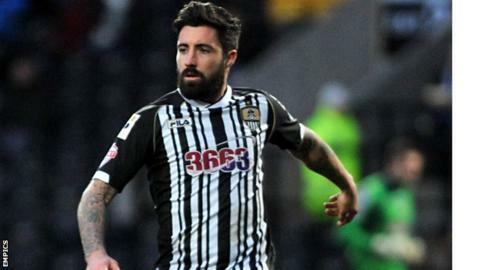 Notts County captain Alan Sheehan is one of six out-of-contract players offered new deals at Meadow Lane. Gary Liddle, Jimmy Spencer, Jamal Campbell-Ryce, Kyle Dixon and Jeremy Balmy have also had contracts offered to them, after Notts maintained their League One status on the final day. The club has also triggered a clause in striker Ronan Murray's current deal to extend his stay by 12 months. Meanwhile, former captain Dean Leacock is among 10 players to be released. The 29-year-old, who has made 74 appearances since joining the Magpies from Leyton Orient in 2012, started the season as skipper under former manager Chris Kiwomya. Other players to depart are Manny Smith, Enoch Showunmi, Adam Coombes, Mark Fotheringham, Andre Boucaud, Gareth Roberts, Malcolm Melvin, Romello Nangle and Malachi Lavelle-Moore. Already contracted beyond the summer are Bartosz Bialkowski, Fabian Spiess, Mustapha Dumbuya, Danny Haynes, Tyrell Waite, Curtis Thompson, Greg Tempest and Haydn Hollis. Brad McGowan and Harry Andrews both graduated from the youth team and will join Shaun Derry's first-team squad in the summer.